Experience the exotic flavors of Cambodian fruits and herbs! 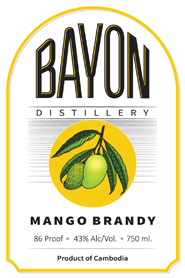 Mango cultivation originated in Southeast Asia; and our brandy is distilled from mangoes grown in Cambodia. We primarily use the Keo Romeat mango; but add other native varieties for different aroma profiles. Enjoy the distinctive tropical fruit in the Eau de Vie style! Borassus flabellifer palm (Cambodian national tree). It is used to process sugar used extensively in Thai and Cambodian cooking. 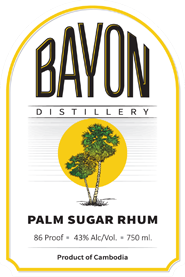 We take the fresh sugar rich sap from the tree and begin fermentation the same day, in the Rhum Agricole style. 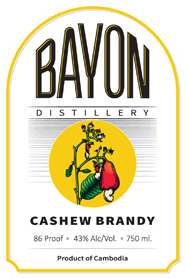 Distilled from the cashew apple—the fruit of the cashew nut. Cambodia is a major supplier of cashews. This fruit begins fermentation in our plant the same day the nut is torn from the fruit. WARNING: Tree nut product. Do not consume if allergic to tree nuts.